Launching Automate Ad Rotation Alpha, Campaign Name Filter, and New Ways to Keep an Eye on Your Automate Activity! In this Automate release we’re very excited to announce our Ad Rotation Alpha, campaign names as an IF condition, Action count summaries, and new search capabilities with the Action Logs. We also shipped design enhancements to the Bulk Action Run Button and numerous bug fixes. We're trying this new format for release notes. Tell us how you like it by giving a smiley or sad face at the bottom of this article! One of the most tedious tasks of a digital marketer is making sure ad creative is constantly rotated to combat ad fatigue. We’re very excited to announce the Alpha release of our newest Automate feature, Rotation! Campaigns, Ad Sets / Ad Groups, and Ads can now be selected and rotated on a regular time interval. When ads are set live or when your "rotation" is complete, you'll receive an email notification. Want a free test drive of Automate Rotation Alpha? Request your Alpha invite below👇! Note: Automate Rotation is in "Alpha". We only release "Alpha" features to a small group of early users, so we can gather actionable feedback to make sure the features we build are making your PPC life easier. Many marketers use abbreviations in their campaign names to help keep campaigns organized. Now you can make changes across accounts by quickly including or excluding campaigns by Campaign Name. Simply select "Campaign Name" as an IF Condition when you're building Alerts and Rules. Let’s say I want to increase bids for all campaigns containing the campaign name Turkey Day Promotion to boost audience reach for the last 3 days leading up to Thanksgiving day. Many marketers have dozens or even hundreds of tasks running and spend a lot of time hopping in and out of tasks to see what changes were successfully made. Now the Last Run (Log) Column displays the last time a Task ran along with a summary of the changes. 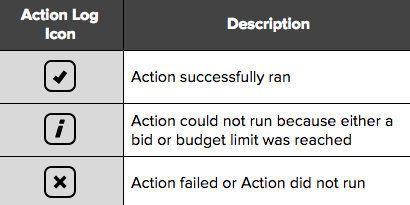 You’ll see icons that designate the number of successful Actions, the number of Actions limited by bid or budget caps, and the number of failed Actions. If you’ve automated a lot of tasks it can be difficult to find the history of a particular change. When you view the Action log the table will be filtered to show you all the changes from the ‘Latest Run.’ You can also change the filter to ‘All Runs’ to see the last 2,000 Actions. We also added Search to the Action Logs. Some very large tasks can take a long time to run and it was difficult to tell whether a Bulk Action was actively running. We’ve added a circular loading animation in the Run Button to make it more clear. After the Bulk Action is successfully completed, the ‘Last Run’ column will update with the timestamp. The Preview and Log were popups but have recently been changed to be full width to provide more space to view the relevant information. We have addressed some design issues with the log and preview. The Recommended Rules/Alerts button was not behaving as expected. (Bad button!) it now shows the proper states when hovered, active, and inactive. In the Action Log, the results column was too narrow and would often cut off the information in the column. The column has been made wider. Bonus: We’re planning on introducing customizable columns in a future release. The currency symbol did not display properly when an account was selected. Now when you choose an option with currency (e.g. no spend yesterday), as soon as a network account is selected, the IF condition shows the currency symbol ($) and the currency code (USD) immediately. If you duplicated a task while it was running the new task would be uneditable. Now new tasks, even those created from a task that was running, will be editable. When choosing entities (accounts, campaigns, ad groups etc.) the Active and Selected filters were not intuitive. These filters were updated to make them behave as expected. We realize this experience is still fairly confusing and we plan on further improving this section. What is an Account Level Rule? How do I set up my campaigns to automatically Edit Budgets based on performance? How do I automatically pause poorly Performing Ads? What does saving my Bulk Action do? Want to Become an AdStage Pro? Get the latest product updates, best practices, and tips to optimize your PPC campaigns with Auomate.